It looks like yet another phone design has been taken for a ride on The Orient Express, only to end up unashamedly copied and turned loose on the market at nearly a quarter the price of the original. The devices we're talking about here are the OnePlus One and its LTE-enabled clone, the Landvo L200G. 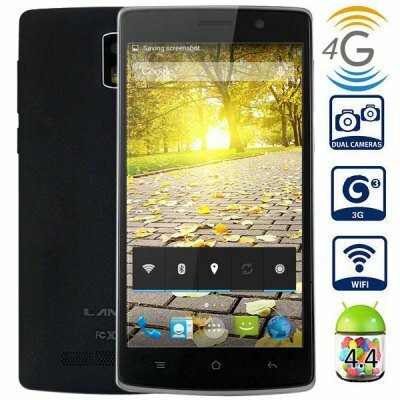 The Landvo L200G has some decent specs for the price, but make no mistake here though, you get what you pay for. Of course, if one is in the market for a cheap handset with a large 5-inch screen that will handle 4G LTE, this might actually be a deal for them. With 1GB of RAM and a 1.3 GHz quad core CPU, this clone doesn't quite match the specs of the OnePlus One, which boasts 3 GB of RAM and a 2.5 GHz Snapdragon 801 quad core CPU, but then at around one-third the price ($100 vs. the $300 price tag of the OnePlus One), I guess a frugal, smartphone-using consumer can't expect too much. Some users might notice a difference in the Landvo in the area of the display resolution, which only comes to 960 x 540p with a 5" screen, whereas the OnePlus One is 1920 x 1080p resolution with a 5.5" screen. Some applications can look terrible at lower resolutions on larger screens, however the clone may somewhat make up for this in that it has an IPS (In Plane Switching) screen over the TFT (Thin Film Transistor) of the OnePlus One. Another notable difference is in the camera. The 5 MP rear camera on the Landvo is quite a bit lower resolution than the 13 MP rear camera found on the OnePlus One. The front camera difference is about the same 2 MP vs. 5 MP. Due to the difference in onboard storage between the two, 4GB vs. the 16/64GB, one might think the Landvo would suffer instantly running out of space, but it does support micro SD cards up to 64GB. The OnePlus One does not offer a micro SD expansion slot so it loses out there. There are other minor differences, a 3100 mAh battery in the OnePlus One over the 2000 mAh battery on the Landvo, for instance, but given the affordability of the Landvo L200G, some might overlook these subtleties in the name of frugality. So, it looks like that as the Chinese clone landscape grows ever more crowded, some manufacturers are finding themselves able to produce some slightly above average quality devices for prices that almost anyone in the market can handle without feeling the need to take out a second mortgage to assuage their tech addictions.